Stadium Jumping is a competition where horses and riders negotiate a course of hurdles or jumps within an arena or riding ring. The jumps are colorful and of varying heights and widths. Wide jumps or 'spread jumps' may include a water hazard that horses must leap over, but not touch. The event is judged by elapsed time and number of faults that reflect the number of jumps knocked down, time penalties, disobediences of the horse and rider errors. Height, width, and number of jumps will depend on your level of competition. Beginners often start with low (18 in./46 cm) cross rails. The goal is to complete the course of jumps without incurring any faults, within the allotted time. This is called a 'clear round'. 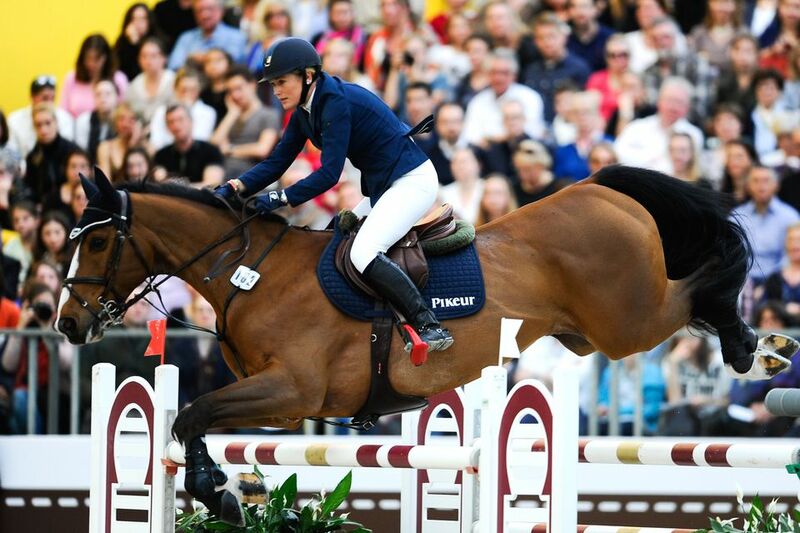 The horse/rider teams may participate in 'jump-offs' if there is more than one clear round. The jump-offs are timed and the goal is then to have a clear round with the fastest time. Your horse and you will need to be appropriately equipped with a forward seat or all-purpose English saddle. You may use almost any type of bit or bitless bridle on your horse with an English style bridle. Almost any type of martingale or tie-down may be used. Rider's attire will vary depending on the type of show--club, schooling, Pony Club, etc. Generally, a short black jacket, breeches, tall boots, and white shirt with a rat-catcher collar is acceptable. Check local rulings, however, as the formality of attire differs at some competitions. Before you ride you will be allowed to walk the course and plan your approach to each jump. Jumps will be available in a ring where you can warm up your horse before you compete. In the ring, you will be given a starting signal (bell, whistle, etc..) and have a maximum time to complete the course. When you finish the course successfully you will wait until all riders are done to see if you are in the jump-off. The jump-off course will be slightly altered and you won't have the opportunity to walk it beforehand. The winners are ranked by the fastest times and fewest faults. You'll want to make sure your horse is completely controllable on the flat and over jumps. Stadium jumping obstacles can be very outlandishly painted and decorated, so make sure your horse is accustomed to jumping in bright colors and oddly shaped jumps. Depending on the formality of the event your horse may or may not need a braided mane. (It's never a mistake to braid if you are unsure.) Your horse may benefit from some leg protection such as bell boots or brush boots. Lessons for jumping are almost a must. You'll need to learn how to approach a jump, stay centered, and negotiate tight turns and combinations of jumps. You will need to learn to memorize courses quickly and make quick decisions. Four faults for each jump knocked down. Four faults if a hoof touches a water jump. Four faults for a refusal to jump, run out. Horse (shoulders and haunches touch the ground) or rider falls. Going and staying off course. One penalty for every four seconds or portion of a second exceeding the time allowed in the first and second rounds and jump-offs. One penalty point for each second or portion of a second exceeding the time allowed in a jump-off against the clock. Stadium jumping can be a lot of fun and it improves the agility and focus of both horse and rider. English or Western: Which Is the Best Riding Style for You?